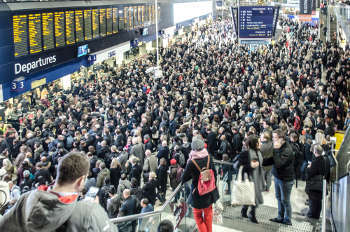 A survey of over 1,100 business across the UK by the British Chambers of Commerce (BCC) found that 39% of firms do not believe the UK’s rail network meets their needs in accessing new and existing customers, suppliers and employers, compared to 34% that do. The survey also found that 36% of businesses believe the UK rail network is less reliable than five years ago, compared to only 17% that say it is more reliable. The poll revealed that 68% of businesses regard the country’s road network as less reliable compared to five years ago, with only 11% believing it is more reliable. While 47% of businesses believe the road network meets their needs 41% believe it doesn’t. However in the 30 days before the survey was conducted, 30% of respondents had not experienced road traffic congestion, while only 57% had experienced motorway congestion, and 49% road and rail maintenance. Jane Gratton, head of business environment at the BCC, said: ‘It’s concerning that many businesses believe reliability has worsened in recent years, particularly on the road network. Capacity constraints, congestion and delays in the development of new routes have left businesses frustrated.